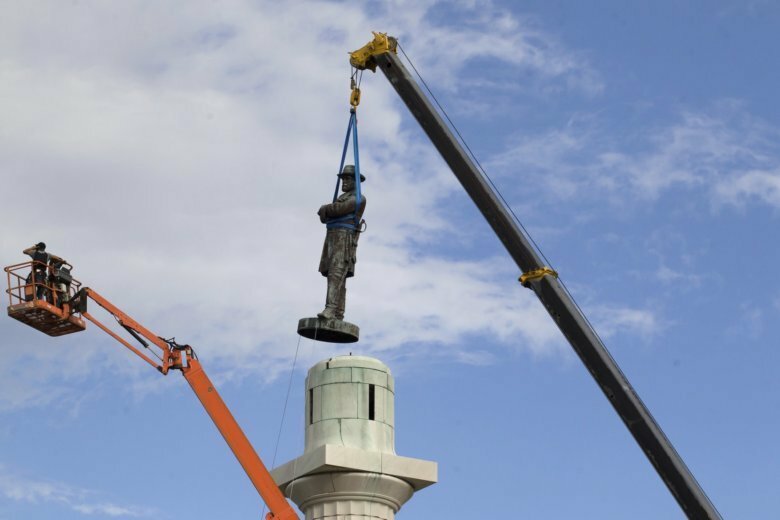 NEW ORLEANS (AP) — Nearly two years since three Confederate statues were taken down in New Orleans, officials are still trying to decide what to do with them. The statues of Confederate President Jefferson Davis and generals Robert E. Lee and P.G.T. Beauregard remain in a city warehouse where they were stored after their removal in the spring of 2017. The monuments, like others to the Confederacy nationwide, have been criticized as symbols of white supremacy and slavery. But those who wanted the monuments to remain standing called them a significant part of history. Louisiana Lt. Gov. Billy Nungesser said he’s hopeful the city will transfer the statues for placement in a state park, but New Orleans Mayor LaToya Cantrell’s office said no agreement has been reached. Nungesser’s office runs the state Department of Culture, Recreation and Tourism. NOLA.com/The Times-Picayune quoted Nungesser in a report Wednesday as saying he thinks a park or historic site could receive the statues and offer sufficient context to satisfy even those who had sought their removal. He discussed the statues Sunday during a speech to the R.E. Lee Monumental Association in New Orleans. In a subsequent interview, Nungesser said he wanted to organize a group of experts to find a proper site. He also offered to move the monuments at no cost and said Cantrell seemed open as well, and that she told him she doesn’t want them on display in the city. In a statement, Cantrell spokesman Beau Tidwell said the mayor hasn’t made a deal with Nungesser but “remains open to a range of options” and plans to continue discussions with him. The lieutenant governor said he’s sensitive to concerns over the statues. Although he hadn’t considered if white supremacist groups could be attracted to a state park displaying the monuments, he said officials are very careful about what events are allowed.